Non-mortise (surface mount) hinges are easy-to-install hardware that can be directly welded or bolted to the frame and door. Be it on doors for armored vehicles, test cell doors or military bunker doors, these hinges meet most demanding environments and high usage applications. Hence, non-mortise hinges assure quick and easy installation, while saving time and labor on mortising the surface for installation. At Kiesler Machine Inc., we bring you a range of finest quality heavy duty non-mortised hinges that are made in a wide variety of door weights, material types and finishes. With robust manufacturing capabilities and engineering expertise, you are guaranteed to find the right non-mortise door hinges or gate hinges that perfectly fits your application. Known for their immense load bearing capacity. Offered with or without mounting holes. Have the ability to withstand high application stresses. Support loads up to 40,000 lbs. 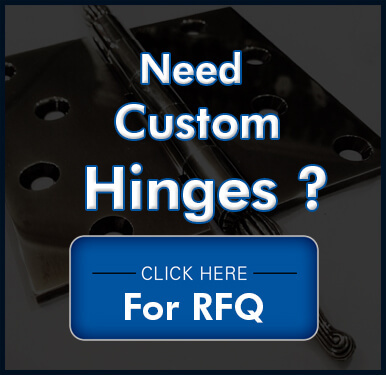 All our hinges are Made in the U.S.A. with pride and quality craftsmanship. They are maintenance free for years of reliable service. Our heavy duty non-mortised hinges are second to none in terms of durability, appearance, and performance. 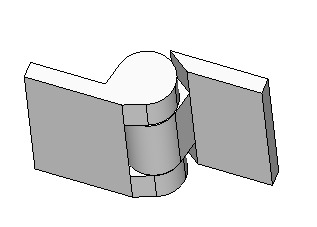 At Kiesler Machine, the non-mortise hinges are offered in the following specifications. Materials: 304L or 316L Stainless Steel or Carbon Steel. Finishes: Carbon steel - Primer coat standard, Powder coat paint is available. Mounting: Weld on or Mounting holes for bolt on applications. Coating: Hot dip galvanized or cold galvanized. Maximum Radial Load Range: Models available for up to 800 lbs radial load. Maximum Door Weight Range: Models available for up 2,000 lbs door weight. Utilizing our vast industry knowledge and experience, our motto is “Smother than the Rest, Guaranteed”. 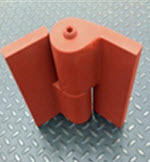 Kiesler Machine Inc’s hinges are the best hinges on the market. Manufactured in the U.S.A. with the highest quality bearings and steel ensures years of trouble free service. Kiesler Machine continues to work with you on developing the right heavy duty non-mortise hinges. With the highest quality in craftsmanship, we are an e-mail or phone call away. We can execute the designing and manufacturing of innovative and high-quality non-mortise (surface mount) door hinges that are cost-efficient, durable and maintenance-free.